1. Alien-like Creatures called ‘Chay Na Men’ Found Near a Cave in Thailand. Strange creatures caught on video. Exploring a small chain of Islands, a tour group stumbled on a frightening sight. They heard a strange “scream” from one of the Islands. And investigating they found these creatures near a cave.. They seemed to be in a strange ritual. The animals seemed to have the appearance of deformed Monkeys. But they walked around on two legs like a human.. The locals said that the animals had emerged from the cave to feed. The locals also had previously warned the tour group to be wary of the Island saying that it was cursed by a “Water Spirit”. The actual history of the area tells of Marooned Sailors and Tribes of Cannibals living around the Islands. What’s also strange is how calm the creatures were around people and some coming up to the main boat out of curiosity or looking for potential meal. According to the locals, there is a small cave system under the rockfage. This could explain how this species has never been encountered before. According to a member of the tour, the locals referred to the creatures as “CHAY NA”, which roughly translate to “water man” in English. From the video, scientists have speculated the species importance, as it could be one of our early ancestors, and could help with fighting diseases and illness. But until one can be caught for study it is unknown what exactly it is. According to the area report, the island is listed as private property, which means that no government body can enter the area. This is a creepy discovery to explain. Overall, what do you think about the alien creatures? Should they be died or isolated? It is unsure what is going to happen to these creatures. Watch the video and share this around, show the world! An interesting video in wide circulation on social media sites purports to show Ewok-like Creatures Discovered near Thailand Cave. The viral video seems to show some weird Ewok-like creatures chilling near a cave, while the people sailing around in Kayaks and Boats are perplexed to see them. So, let us examine and find out the truth behind the Ewok-like creatures discovered near a cave in Thailand. 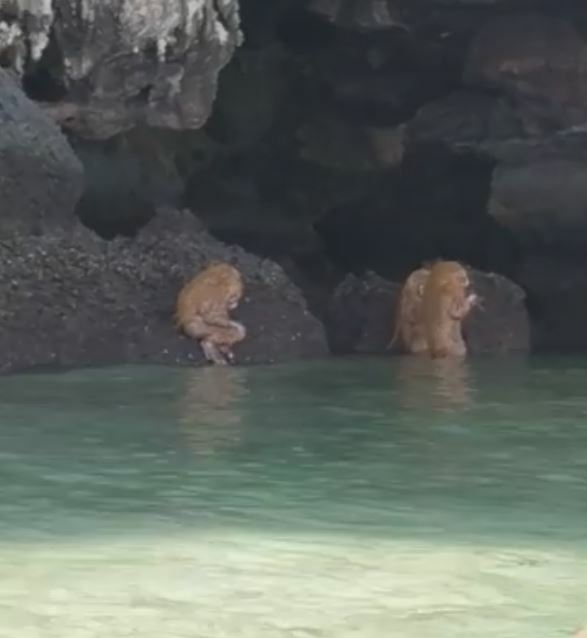 On 2nd of November 2018, Facebook user Jemayel Khawaja shared the video saying they came across the Ewok-like troll creatures while kayaking around Railay Bay in Thailand. He also mentioned the strange creatures engaged in some cacophonic ritual in the water for about 30 minutes. The video appeared later on YouTube and elsewhere with similar and other stories attached to it. Consequently, some even described the strange creatures looking like deformed monkeys are called “Chay Na”, which roughly translates to “water man”. Ewoks are in fact fictional species of small, mammalian humanoid creatures that appear in the Star Wars universe. Likewise, they appeared in the 1983 film Return of the Jedi and few television shows, apart from some books and games. Like in picture below, Ewoks appear somewhat like Teddy Bears too. Thailand Biennale shared about the performance art on Facebook earlier on 31st Oct. 2018. The video post also described the creative artist’s work. In other words, Tori Wrånes interposed her imagination of indigenous ‘Krabi creatures’ in the daily life of tourist destination at Phra Nang Cave and Beach in Krabi Town, Thailand. So, the claims about Ewok-like creatures discovered near Thailand Cave are just hoaxes. Not to mention, the national art festival in Thailand is from 2nd November 2018 to 28th February 2019.